I had the delightful opportunity to take Olivia to her very first play this past Sunday -- the world premiere of "Diary of a Worm, a Spider and a Fly" based on the bestselling books by Doreen Cronin. 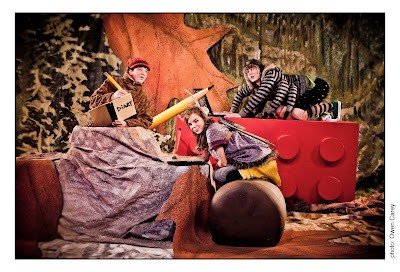 In addition to being charming, witty and fantastically well-acted, this humorous musical, the current production at Oregon Children's Theatre is also very green! The show's production materials are 90% recycled and reused -- and once the show is over, the production staff will aim to find new homes for the materials to be repurposed. Some of the set background includes "reused vinyl billboards, set leaves that are made from carpet used for former Oregon Governor Barbara Roberts' campaign event, and costume wings made from used car headlight covers and kitchen equipment." Check out the theater's blog to see MANY more ways the show's set and costumes are green. Beyond the stage, the playbills are printed on recycled materials and the flashlights used by the ushers feature LED bulbs and rechargeable solar batteries. I must add that my favorite eco-friendly element of the show were the ant character's cute red TOMS shoes! (He also happened to be my favorite actor in the play!) Each and every actor was so talented and captivating. Whether singing a solo or a group number, they all delivered 110% and truly made me, an insect loather, feel more affinity for spiders, flies, bees and worms! At a very mature 3 years old, Olivia was still just a touch young for this show. Most of the witty jokes and dialogue soared right over her head. That said, she was still thrilled to be there and she smiled ear to ear the entire time, clapped on cue and laughed on cue, even if she wasn't in on the joke! But, I can see why the recommended age for attendees is 4 and up -- and "Diary of a Worm, a Spider, and a Fly" will certainly enchant audiences of all ages. I was enthralled for every minute of the approximately 70 minute production.